It would be "unwise" for former Zimbabwean first lady Grace Mugabe to enter South Africa again. This is the view of Nicole Fritz, executive director of Freedom Under Law. Fritz told News24 on Monday that the South Gauteng High Court's ruling to set aside the Department of International Relations decision to grant Mugabe diplomatic immunity in August last year, set a precedent that people who have status and influence can't visit South Africa "with impunity". "It is a huge victory for us," Fritz said. 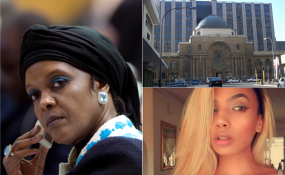 The decision to grant Mugabe diplomatic immunity was taken by former minister of international relations and cooperation Maite Nkoana-Mashabane after Mugabe allegedly assaulted Gabriella Engels in a luxury hotel in Sandton in August last year. Lobby group AfriForum and the DA challenged the department's decision. Freedom Under Law was listed as a friend of the court in the case. According to Dr Llewellyn Curlewis, senior lecturer in criminal and procedural law at the University of Pretoria, the court's decision paves the way for Mugabe to be prosecuted. "This can be done by either the National Prosecuting Authority (NPA) or, should the NPA for whatever reason decide not to prosecute, by the alleged victim (Engels) or her representative." Curlewis believes there is enough prima facie evidence for the NPA to make the "intelligent decision" to institute criminal charges against Mugabe. And, even if it didn't, a private prosecution by Engels would be highly likely. "Either way, a summons will be issued for Mugabe to appear in court to face charges. If she refuses, she could either be extradited or arrested as soon as she enters South Africa. "There is no obligation on any country to extradite a citizen to another country, it's a diplomatic and political issue. But she will be arrested should she come to South Africa, once she has been summonsed to appear in court and refused." Criminal law expert and North-West University professor Pieter du Toit agrees that Mugabe could likely face prosecution, whether the NPA pursues the charges or not. "If the NPA refuses to prosecute Mugabe, a private prosecution can be instituted by the alleged victim. That means she will be arrested and have to apply for bail after it will be treated like any other criminal case." Curlewis told News24 he would be "surprised" if the NPA didn't charge Mugabe. "The next step is to get her in court. Thereafter, it will be handled much like any other criminal case. She will be given the option to apply for legal assistance, she will be asked to apply for bail if relevant and the case will be heard." The ruling comes as Zimbabweans go to the polls in that country's first general election since former president Robert Mugabe was ousted last year, after ruling that country since 1980.